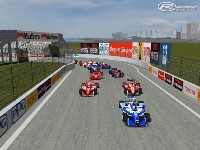 This is a conversion of the old old OLD IndyCar Racing 2 version of Long Beach. It appears to be the layout used from 1992 to 1998. The ICR2 tracks were very low res and low poly count. And while I have done a lot to try and spiff it up it is still far from current standards. But cut the track a bit of slack. As I am mainly doing this for nostalgia, for old times sake. For the "good old days" when ICR2 was the best open wheel sim available. I would recommend warming up with the Atlantics. Then move up to the Xrace cars. There is also plenty of night lighting if you want to try a GT Endurance race. simply awesome! Thank you! would love to the old Vancouver layout of these great times,too! Great Track. This brings back a lot of memories of playing ICR2. Any chance you might be doing some other ICR2 tracks? I would love to see the Detroit track, I went to a lot of CART races there, and it was always a fun track to race on.